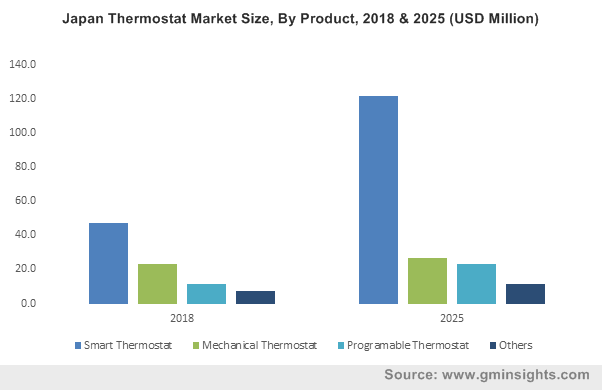 Thermostat Market Growth « Global Market Insights, Inc. The escalating development of sustainable codes and standards across residential and industrial buildings is bound to majorly propel the thermostat market growth. Not to mention, this industry has also been receiving momentum from the rapid advancements in heating and cooling technologies, that are being installed in most modern homes and buildings lately, to offer added comfort to residents, specifically in regions experiencing extreme cold or heat waves. Indeed, thermostats play a key role in the functioning of these systems as they offer efficient monitoring and control over temperature. Advancements in energy-efficient temperature systems and smart home automation devices will thus positively influence the demand for this product, propelling thermostat industry growth. Another pivotal factor that would augment the market trends is the growing customer concern regarding climate change along with the rapid proliferation of IoT. Speaking of the various products disrupting the market, it is prudent to mention smart thermostats – these are likely to gain mainstream attention in the years to come on account of the rising adoption of IoT and cloud technology along with their compatibility with various smart home assistants like Google Home & Amazon Echo. Coupled with a Wi-Fi module, a smart thermostat system can connect to the user’s home or office network to offer interface via the cloud, thereby allowing remote temperature control and monitoring over the unit. The product also allows users to vary temperature parameters using a smart thermostat dedicated mobile app, and to collect useful insights regarding the device that would certainly improve the user’s quality of living. The product has seemingly found long-term application in heating and cooling appliances like HVAC, water heater systems and more, that has helped augment the smart thermostat industry growth. The residential sector is likely to emerge as a pivotal growth avenue for the global thermostat market in the ensuing years, driven by the rising implementation of energy-efficient small-scale heating and cooling systems. According to the U.S. Energy Information Administration (EIA) reports, in 2018, the use of electricity for space cooling in the residential sector was about 214 billion kWh, which is equal to about 15% of total residential sector electricity consumption and 5% of total U.S. electricity consumption. These figures can be appreciable lowered by adopting smart thermostats which help reduce energy consumption while increasing the efficiency of household products. The smart thermostat also regulates the temperature in buildings in a smarter way than conventional thermostats and further offers added savings in customers’ electric bills. The increasing adoption of smart home automation systems has also led industry participants & core manufacturers to shift their focus toward the expansion and innovation of advanced devices. The development of advanced techniques, such as speech recognition, machine learning and motion detection, indicate lucrative opportunities for thermostat applications across the residential sector. The advent of cost-effective products coupled with growing investments toward smart homes will positively influence the overall thermostat industry trends. One of the most remunerative markets for thermostat industry is the United States. Irrefutably, the regional market has been gaining momentum on account of the ever-rising expenditure toward infrastructure in tandem with the investments in renovation and refurbishment projects. As a matter of fact, the Building Technologies Office (BTO) estimated that over 70% of U.S. buildings, by the year 2035, will either be new ones or renovated by 2035. Powered by the growing number of renovation projects and the rising penetration of home automation systems, not to mention, the frequent occurrence of weather-related disasters, the U.S. thermostat market size will hit 24 million units in terms of volume by 2025. Lately, smart thermostats have been found to come with Wi-Fi and cloud connectivity which delivers remote controlling features and data insights to users on mobile via an app. The product is mostly used for space heating and cooling controls, and is extremely ideal for central air conditioners & HVAC systems. Powered by the extensive deployment of smart home automation systems and the rising acceptance of advanced IoT solutions, the thermostat market size is expected to surpass $6 billion by 2025, according to Global Market Insights, Inc. This entry was posted in ENERGY, MINING, OIL AND GAS and tagged Thermostat Industry, Thermostat Market, Thermostat Market Analysis, Thermostat Market Growth, Thermostat Market Outlook, Thermostat Market Pdf, Thermostat Market Price, Thermostat Market Report, Thermostat Market Share, Thermostat Market Size, Thermostat Market Trends.